Have you ever discovered the world below the waves? Ever seen the seabed, corals and schools of fishes pass by, while gliding through the water? The only noise you hear around you is your oxygen tank and the wonderful tranquility and magic of the sea. The time for diving has never been so ripe than it is right now. The long awaited season for divers has just begun. The tall waves have been replaced with a peaceful view over the ocean. No waves on the horizon, but instead you’ll find a great variety of sea life below the water. What that means for you? It’s time to go diving! Those of you who already tried to dive before, do we need to say more? You probably know all about the fantastic beauty of the sea. To those of you that never tried it before, we can only encourage you to try at least once. Come with us, enjoy the freedom of gliding through the blue water, explore corals, swim with the fishes and enjoy the peaceful life away from the one above sea level. Forget those busy times for a second, come dive in an undiscovered world with us! Scuba diving is much easier than you may think. As in life, when learning new things, it is a challenge at first, but oh – the rewards! At Nautilus Diving in Phuket, at Kata Beach, we’ll walk you through each step to become a true underwater discoverer. Our lessons are fun and you’ll be learning from instructors that have been underwater for many years, people who are fun to be around and who can teach you tips and tricks, some that even may be interesting for experienced divers. You’ll never stop learning. Take part in our courses and meet other people from all around the world, who also take their first steps into the world of diving. Be ready to enjoy a new challenge and dive into a new world – with new friends! You’ll find all your needs catered to here. Nobody will try to convince you to do things that you are not physically, or mentally ready for yet. We arrange our diving lesson around the individual needs of our participants and even one on one instructions can be arranged, if that makes you feel safer. For tranquility and adrenalin, there’s something for everyone here at Nautilus Diving. Divers are members of a special community, where they can meet new people and share the knowledge they gain. 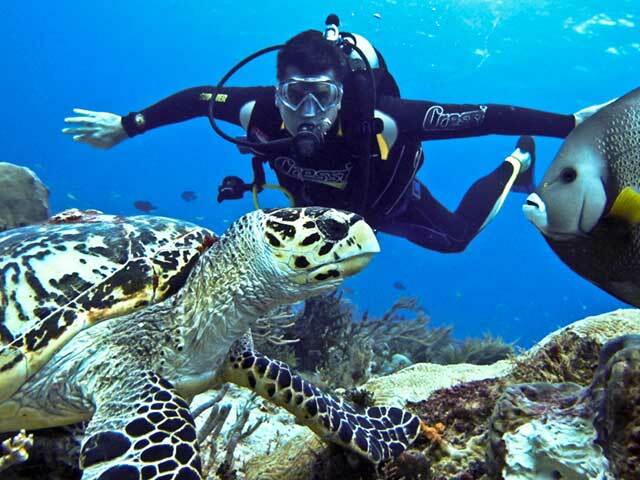 Scuba diving will reveal new sites and new experiences, an up-close and personal encounter with marine life. Scuba diving doesn’t end with entry-level certification. As you gain confidence, you will be able to take more advanced course work that enables you to explore new environments. Take advantage of all the educational programs offered by Nautilus Phuket Diving, You’ll discover something new about the underwater world and yourself every time you venture in – guaranteed. Nautilus Diving is located right on the beach, within very few steps you can go onto your first or next diving adventure. What are you waiting for? Families, groups and individuals alike – there is adventure waiting for everyone at Nautilus Diving in Phuket! Pictures tell more than a thousand words, so have a look at our gallery also, so you can see our guests, instructors and equipment before you plan your visit.